(NaturalNews) The price of centralized healthcare extends far beyond just the costs of providing medical services, as a new study published in the British Medical Journal (BMJ) reveals outrageous levels of fraud and corruption that are costing taxpayers billions of dollars. According to data compiled as part of a larger research project into medical corruption, the U.S. loses as much as $272 billion annually due to things like medical embezzlement and insurance billing fraud, both of which are rampant. The study out of India points to healthcare as an inherently high-risk sector that is prone to fraud, especially when the government gets involved. 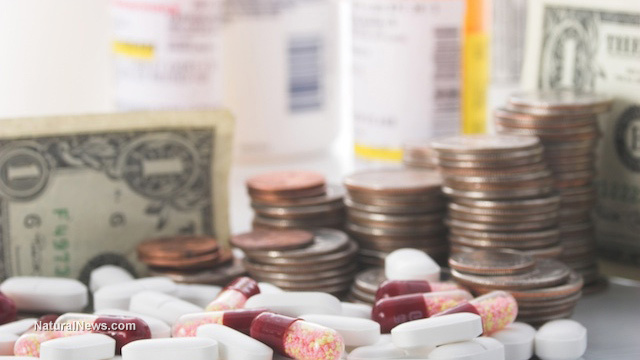 Globally speaking, up to 25 percent of what is spent on healthcare services ends up being siphoned away by criminals, both in the public and private sectors. And much of this fraud, as explained by the researchers, goes unaddressed because it is so deeply embedded and normalized within the system. "Best estimates are that between 10% and 25% of global spend[ing] on public procurement of health is lost through corruption," explain the authors. "The United States, for example, lost between $82bn and $272bn in 2011 to medical embezzlement, mostly related to its health insurance system." While in the process of being "reformed," the American medical system is still largely private, with private insurance companies managing much of the healthcare burden for working Americans. And yet a bulk of the nation's medical fraud occurs within public sector health services like Medicare and Medicaid, which account for more than one-third of all known fraud. As explained in a recent piece for The Economist, nearly $100 billion in fraud takes place within the confines of Medicare and Medicaid spending, while the remaining $172 billion occurs elsewhere. And once Obamacare kicks into full gear, the level of fraud will balloon even further, as it already has just within the realm of the Obamacare healthcare exchanges, most of which have failed despite hundreds of millions of dollars in government spending. In the US, federal regulators have reportedly stepped up the charge to address rampant healthcare fraud. Probes into more than 2,000 alleged cases of fraud, according to The Economist, were launched just in 2013 alone. Hundreds of people have since been charged for their alleged roles in illegally milking the system for their own personal gain. But as noted by one report on the subject, fraud migrates and mutates, meaning it simply relocates and takes new form once it has been outed. Unless the entire system is reformed to root out corruption and establish some enforceable level of ethical and moral accountability, there is simply no way to truly stamp out the criminal elements of the healthcare racket that are gradually bankrupting the country. "It will be challenging for patients and doctors to take on a system mired in corruption," adds the BMJ study. "Simple and effective channels for complaints must be established, and appropriate legal support and protection provided to whistleblowers. ... Doctors have allowed sleeping dogs to lie for too long because of fear, lethargy, and complicity. It is time to reflect and hold ourselves and our peers accountable."